Victimisation. When it’s perceived, the level of affrontedness could possibly be seismic. Add to that, on a world stage with millions watching on, there’s only one way it’s going to go- and no matter what, it can’t be good. And so it was with Serena Williams in that grim US Open Women’s tennis final. Threatening officials is inexcusable there’s no doubt, and she does have previous form on that front, but it’s pointless relating other incidents to this one. Why? Because each circumstance and dynamic is totally different. The history is different. The stage of the career is different and all the peripheral stuff that goes along with it. Let’s pull no punches though, this particular incident was jaw-dropping. We’ve never seen anything like it. And the more you analyse it, the more confusing it gets. Because gender and race are in the mix. They have to be. The pointed difference here was in the sheer intensity and prolonged nature of the shouting and remonstrating. It bordered on scary and it obviously came from deep places within. Call it a multi-layered, hugely indignant, righteous outburst. It will be recalled as perhaps the number one meltdown in top-level sporting history. 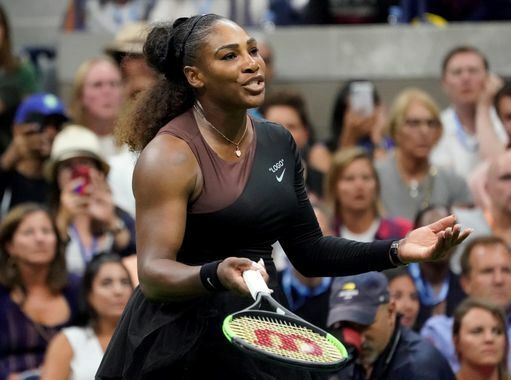 The bare facts of what occurred are that Williams had a massive confrontation with Ramos- firstly over a warning for coaching from her team box. She didn’t like that very much, even though her coach later admitted he’d been doing exactly that. Much worse followed when she descended into personal, verbal abuse and was penalised on the scoreboard. In fact, Ramos would have been within his rights to have disqualified her from the whole match. Williams would know she holds a great deal of power and influence. She must have known she could push things really far and still be allowed to remain on the court. The gist of her rage came from her perception that female players are much more likely to incur code violations. The statistics say otherwise. But if Williams had made the point about actual warnings, there may be element of truth in it. All said and done, she chose the wrong platform and time to bring her grievance to. But on the other hand, you could still feel that her anger and anguish was completely genuine. It was raw emotion- it wasn’t faked. You don’t choose when that comes out. More like it chooses you. And raw emotion from anyone certainly makes the onlooker sit up and take notice. There is also another aspect- did she suddenly bring up the injustice angle (even though it may have been percolating for a good while) from the depths of her mind when things got a bit desperate? It was legitimate by her own reasoning alone, but was it’s root actually a bit of spontaneous by-play in disguise? The business of women being told/taught to be perfect- that’s obviously a very real and proven phenomenon. If that is so, (and something that has been strangely absent from most discussions), was the self-imposed and public pressure on Williams to draw level with the Australian Margaret Court’s record of 24 Grand Slam titles almost too much to bear? Williams is only about a month younger than Roger Federer. They are both 37 years old. They might be able to keep playing for a long while yet, but to still be able to win Grand Slam titles nearing their forties? Who knows what the future holds, but the clock is ticking. Was all that subconsciously on Serena’s mind up against Naomi Osaka? She badly wanted this title on home ground to draw level with Court’s world record. And up against a first-time finalist and a player not ranked in the top ten (even though Osaka’s ranking didn’t really reflect her immense ability), she may just have visualised her name on the trophy a bit too prematurely. Did the stress of all that slipping away during that match push Williams off the edge of rationality just that bit further; leading to all that outpouring? I’m saying yes. And let’s face it, she did go too far. She will likely be traumatised by this, forever possibly. Has she sullied her legacy? I can’t really say with conviction. Probably yes, because of other bad incidents of personal threats and abuse. Really interestingly though- should she care? You could quite easily say no. She seemed to be trying to make a point. It’s scarily complicated. And it’s got me conflicted. But it was grim viewing, for sure. And no matter what, you can’t escape the race element to it. We don’t know that someone may have said something highly derogatory from the crowd. And that could easily have ramped up her level of anger. Novak Djokovic had the best comment of all concerned: ‘With all that emotion, it was a tough, tough day out there for everyone’. Within the incident everyone ‘lost’ somehow, even Osaka. Not to mention tennis and objectivity. At least for now. And it will be the sports story of the year.